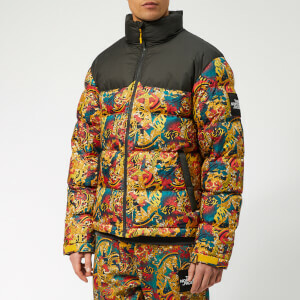 Combining winter weather protection with serious mountaineering style, The North Face '1992 Nuptse' Jacket is built from durable fabric that has been DWR-treated for ultimate water repellence. Classic baffles filled with lofty Responsible Down Standard (RDS)-certified goose down provide cosy insulation during hikes and expeditions. One of the brand's most iconic styles, the padded coat features a high collar to protect against wind chill, a central zip fastening and multiple pockets: two zipped hand pockets and an interior zip pocket. Comfortable to wear, the jacket is finished with an adjustable hem and cuffs for flexibility. TNF® branding throughout and Nuptse celebration label inside. Shell: 100% Recycled Polyester with DWR Finish. Fill: (RDS) Certified Goose Down.